The Champs are back (to-back-to-back) in the Finals! | ENTOURAGE BASKETBALL INC. The Champs are back (to-back-to-back) in the Finals! Grudge match. Revenge game. Redemption. Call it what you will, the playoff semifinal between two of Crossover League’s best teams this season, both had identical 10-1 records, was building up to be a fantastic clash. Average Joes had dealt the reigning champs their only loss of the regular season, a low-scoring, one-point defeat back in August and had won 9 straight games before (oddly enough) choosing to forfeit their final regular season game against Proform. A head-scratching decision that would cost them dearly in the second round of the playoffs. With a history of animosity dating back to Season two (2016) of the Crossover League, both teams were a lock to play with passion and the referees would surely have to be at the peak of their powers to manage affairs. The 12-man semifinal roster for the defending champs had a SENSATIONAL first half against their rivals. How impressive was their showing? Holding a Basketball team to seven points in 20 minutes of play is frankly…. remarkable. Especially a top-3 team in the standings. E.B.I did it with great communication, timing and focus. The first unit, Chi, Dave, Lester, Alex and Jean Baptiste, pounced on their opponents in a ferocious manner, creating fastbreak opportunities with intense defense. Even with the squad’s nominal starting power Forward (and the league’s 2nd best rebounder) Sebastien ruled out for the rest of the playoffs due to illness, plus the absence of second best scorer, Jerel, the starters did not miss a beat. As has been the case all season long with the deep roster, there was no drop in quality when the second unit stepped oncourt. Playmakers Javier/ Alejandro, scoring guards Terence/Ronnie and hustling forwards Mike, Josh and Manuel displayed even more passion, going after every loose ball, while scoring within the framework of the team. The “second unit” was the better scoring team in the lopsided first half of the game, with Terence having his best game of the season, while long-absent Alejandro bulldozed his way to the hoop for tough layups. Labouring and injured Josh and Manuel showed great heart while battling in the paint, yet still contributed on offense too. Then as has been the case in recent post-season games, Ronnie showed up when the pressure is highest, scoring and defending with ease. With the game out of hand, the “slacking” men-in-black conceded 15 points in the second half, match progression was punctuated by some fantastic individual highlights. Chi running the break at his usual insane speeds…. The icing on the cake though was big center Jean Baptiste stealing the ball near center-court, going behind his back to evade a defender, losing his handle, regaining it by tip-toeing the sideline, then going for a Jordanesque up and under layup while being fouled: his teammates basically lost their minds at that sequence. As emphatic a “game over” as the young league has ever witnessed. 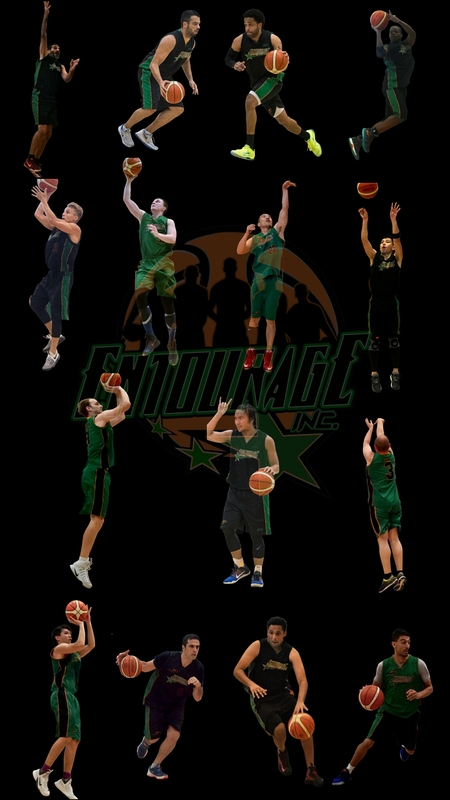 Unprecedented in the club history, EntourageBBall Inc’s weekend team has now qualified for it’s third consecutive playoff Finals. Fantastic as that is, the prospect of a “Three-Peat” (shout out to MJ’s 91-93 Chicago Bulls) can not gloss over the fact that a serious opponent awaits in the Finals. Team Monstars updated their roster after a slow start to the season, adding scoring at all positions. Their starting five is at the level of E.B.I. and they have been rolling through the season to the tune of 8 straight wins. EntourageBBall has never lost to the Monstars dating back to Season Two of Crossover league, but these new and improved Monstars are an altogether different, and dangerous, animal.